Prior Price Trend is not relevant, the price can come from both directions. However, the empirical evidence suggests the higher occurrence of a bullish prior trend. Shape is obviously triangular with two trend lines. The price needs to hit at least two times each line. The upper line is more-less horizontal and the lower line is sloping upward. Length of the pattern completes between 1 month and 1 year, however the best performing with best succession rate on average complete between 3 and 6 months. Volume is not relevant. 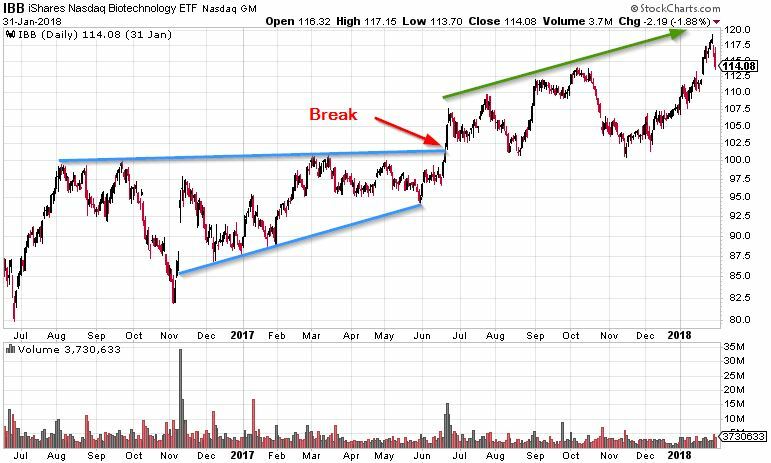 During the pattern completion, the volume tends to modestly decrease and then increase on a breakout (empirical studies confirm 75% of such occurrences). However, any other scenario is fine with the ascending triangle pattern. Breakout happens when the price moves above the upper trend line. This a time when a trader is taking a long position. The success rate of upward breakout is 65% of times. Unsuccessful completion of ascending triangle pattern would be when price breaks down through the lower trend line. The rate of such case is 35% of times. It is never clear whether the underlying security will go into a bear market and thus, short selling is not recommended. After the successful breakout, the price tends to return to the upper trend line (resistance becomes support) to test its new support level. Target is generally defined by measuring a vertically widest area of the triangle pattern and applying this area above the upper trend line. However, the price may go even higher and thus, the target should be considered once the current trend is broken. The price tends to form another bullish pattern (e.g. rectangle) at this generally assumed target level and then continues to rise. Prior Price Trend must exist, thus if we are expecting the breakout to be upward, the bullish prior trend is necessary. If we are expecting the breakout to be downward, the bearish prior trend is necessary. Shape is also triangular with two converging trend lines. The upper trend line moves downward with price recording lower highs at least 2 times. The lower trend line moves upward with price recording higher lows at least 2 times. The activity within this areas should be high. We don’t want to see empty space – the bigger the candlesticks, the better the performance. Volume is relevant here. As the trend lines converge, the volume decreases. Typical behavior of supply and demand. Breakout happens when the price moves above the upper trend line or below the lower trend line, depending on which prior trend is followed. Target is generally defined by measuring the vertically widest area of the triangle pattern and applying this area above the upper trend line or below the lower trend line, depending on prior trend setup. However, the price may go even further and thus, the target should be considered once the current trend is broken. Prior Price Trend is not relevant, the price can come from both directions. However, the empirical evidence suggests the higher occurrence of the bearish prior trend. Shape is triangular with two trend lines. The price needs to hit at least two times each line. The lower line is more-less horizontal and the upper line is sloping downward. Volume is not relevant. 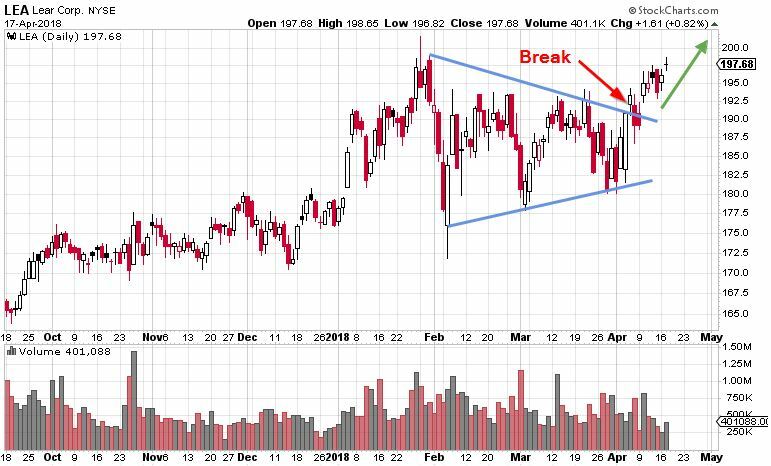 During the pattern completion, the volume tends to modestly decrease and then increase on a breakout (empirical studies confirm 80% of such occurrences). However, any other scenario is fine with the descending triangle pattern. Breakout happens when the price moves below the lower trend line. This a time when the trader is taking a short position. 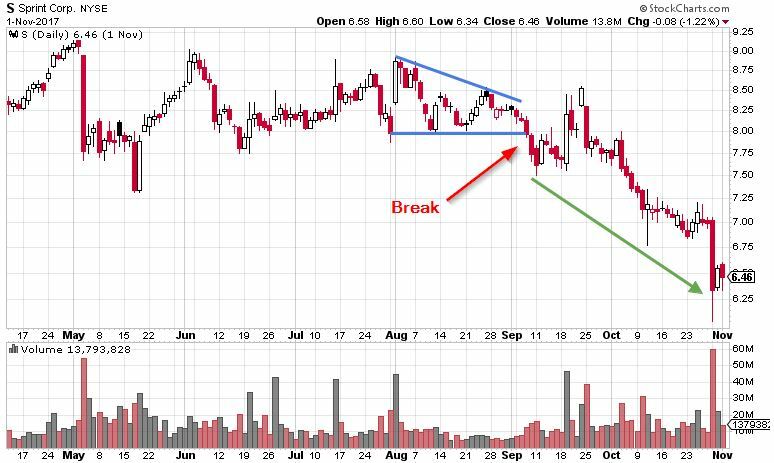 The success rate of downward breakout is 66% of times. Unsuccessful completion of ascending triangle pattern would be when price breaks upward through the upper trend line. After the successful breakout, the price tends to return to the lower trend line (support becomes resistance) to test its new support level and then it continues to fall. Target is generally defined by measuring vertically widest area of the triangle pattern and applying this area below the lower trend line. However, the price may go even lower and thus, the target should be considered once the current trend is broken.